During the 1980s and 90s, Astroland sponsored air shows featuring Air Force, Navy and Army flyers and parachute teams. The last air show in Coney Island was in 2000. June 1, 2015: The Air Show was moved from Coney Island to Newburgh, NY! Scroll down for update. City officials have just signed off on an air show that will bring teams of flyers and parachutists to Coney Island this summer, according to a report by Jeanine Ramirez of NY1. The show will cost more than $500,000, but sponsors have agreed to cover all expenses. The event is scheduled for August 29 and 30. “So much fun! I’m so happy they’re bringing it back! So exciting!” Tina Georgoulakos of Paul’s Daughter told ATZ. Among the iconic photos on display in her boardwalk eatery is one of a parachutist landing on the beach in front of her family’s business, then called Gregory & Paul’s. Friends who’ve attended Coney Island’s famed air shows of the past –the last one was in 2000– say the jumpers landed with unerring precision on targets set out on the beach. The New York City Air Show in Coney Island has been on the Coney Rumor Mill’s radar since last summer and on fan websites since early this year. Fence Check says the venue is MCU Park and lists the following participants: Air Boss & Consulting International, B-25 Panchito, Horsemen Flight Team, USAF F-22A Raptor Demo, USAF Heritage Flight, USMC AV-8 Harrier Demo, USN F/A-18 Hornet East Demo – VFA-106, USN Leap Frogs, and Mike Wiskus & the Lucas Oil Pitts. The new air show has a logo, a website under construction and a Facebook page. And they are already planning ahead for next year with “the New York City Air Show in Coney Island” on the Blue Angels schedule for August 20-21, 2016. 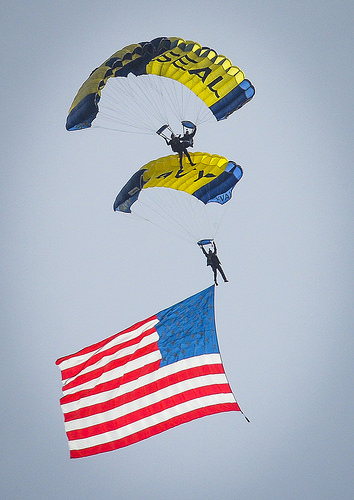 Throughout the 1980s and ’90s, Astroland sponsored not only the USAF Thunderbirds but also the US Army’s Golden Knights parachute team as well as the Navy’s Blue Angels in 2000. 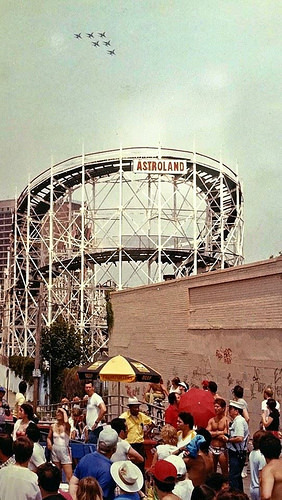 The walls of Astroland’s office were emblazoned with dramatic news photos of these annual events. The flamboyant Coney Island press agent Milton Berger was the “air show chairman” and a master at estimating attendance. “For the first day of a three-day air show, he reported a crowd of only 750,000, but only to leave room for much bigger crowds that he would report for the next two days,” his obit says. How many people are projected to attend this year’s air show? In 2010, a Coney Island Air Show featuring the Thunderbirds was planned but could not get all of the necessary permits–a complicated situation by all accounts– and was cancelled. The director of that show told ATZ that “a conservative estimate would be 500,000 per day.” The air show will also be visible for blocks beyond the amusement district. According to the USAF Thunderbirds fact sheet, the largest crowd in USAF Thunderbirds history –2.25 million– was on July 4, 1987 at their Coney Island air show. Fourth of July air shows and fireworks have been a Coney tradition since the 1940s. In 1957, New York City’s delegation to the House of Representatives lobbied the Secretary of Defense for a national air show in Coney Island that would demonstrate America’s “airpower for peace.” The May event grew into Armed Forces Week with the sponsorship of the US Air Force Recruiting Services, the City of New York and the Coney Island Chamber of Commerce. It’s been 15 years since Coney Island’s last air show but 2015 won’t be the year for a long-awaited comeback after all. 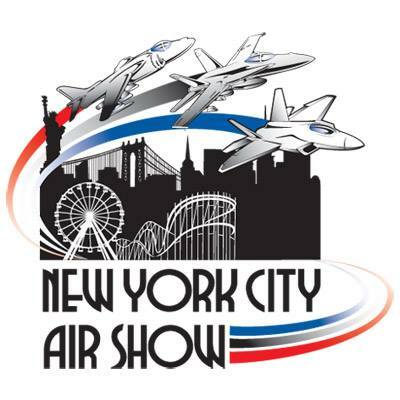 ATZ has learned the New York Air Show that was planned for Coney Island on August 29 and 30 is being moved 60 miles north of New York City, to Stewart International Airport in Newburgh, NY! This is great news. 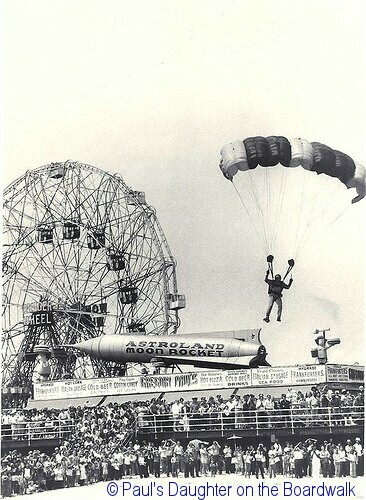 I always enjoyed the air show at Coney Island. Next year will be even better with the Blue Angles being there. This one is from 1986. Wow! This is awesome — I missed those air shows. Thanks for sharing your videos! Sorry, I have no idea. Since the air show was moved from Coney Island to an upstate location, I stopped covering it.